Massey’s Mill which was an ideal site for heavy industry in the 17th Century. Its location provided water power for the finery, the chafery and the slitting mill and access to woodland for charcoal. The Forge was well sited on the main north-south route between Lancashire and the Midlands for the movement of the finished products. 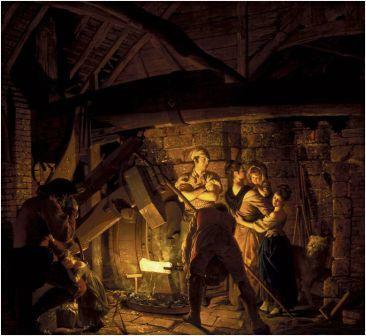 The earliest record of the Forge is the 1660s with information concerning the purchase of wood for charcoal, which at that time was the main heating fuel. Cranage Forge was situated alongside the River Dane on the site of The main activity was the refining of pig-iron into wrought iron. The pig-iron came mainly from the furnaces at Church Lawton and Vale Royal. The first process was carried out in the finery, where the pig-iron was repeatedly heated in the hearth and hammered until the remaining carbon was beaten out. At the chafery hearth the hammer man would reheat the iron again to be drawn out into bars. Some of the bars would be worked through the slitting mill into rods for the nail making trade. Estimates of the amount of wrought iron produced at the Forge may have reached over 150 tons per year at peak times. By the 1750s the use of coke, rather than charcoal, in the smelting of iron and other factors brought to an end the iron industry at Cranage. The site continued as a mill utilising the water power for silk production and flour milling into the 19th century.